// Tables have no explicit size -- they resize automatically on demand. // ...and set it's column span so that it takes up the whole row. Gets the number of cells on a given row. Inserts a row into the FlexTable. Ensure that the cell exists. Ensure that the row exists. Remove all rows in this table. 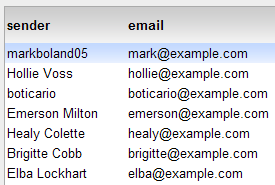 Removes the specified cell from the table. Removes a number of cells from a row in the table. Explicitly gets the FlexTable.FlexCellFormatter. The results of HTMLTable.getCellFormatter() may also be downcast to a FlexTable.FlexCellFormatter. row - the row to prepare. column - the column to prepare.